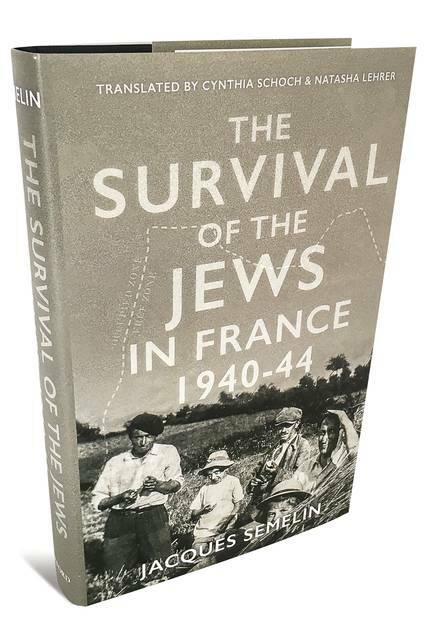 ‘In some countries, the French have the reputation of being anti-Semitic,” Jacques Semelin writes in “The Survival of the Jews in France, 1940-44.” It is the goal of his careful study to show that France as a nation deserves more credit for helping save the majority of its Jewish population from death during the German occupation. The figures are striking: There were about 320,000 Jews living in France in 1940, including some 135,000 immigrants. Of this total, a quarter were deported and murdered by the Nazi killing machine. But 75% survived to the end of the war—a stark contrast with countries such as Poland and the Netherlands, where the percentages were substantially reversed. Originally published in France in 2013, Mr. Semelin’s book caused quite a stir, for it appeared to many that he was mitigating grave injustices perpetrated by the Vichy government and its supporters. Perhaps that is why the present English-language edition—which is about 500 pages shorter than the original—has a new preface, by the eminent Holocaust historian Serge Klarsfeld. Nevertheless, Mr. Semelin’s thesis remains forthright: “French society acted as a safeguard” against the murderous efforts of the Nazis. Innumerable acts of “micro-resistance,” of “civil resistance,” created a “supportive web of social relationships” that benefited most Jews. Mr. Semelin, professor emeritus of history at Paris’s Institut d’Études Politiques, holds that the Vichy government was either too inefficient or too “French” to aid substantially the Germans in their deportation of Jews. This despite the fact that most Jews were arrested by the French police, not the Germans. Nevertheless, both he and Mr. Klarsfeld surprise us by revealing that in 1945 many Jews, wearing the required yellow star, were openly walking the streets of Paris and other large French cities. This is the anomaly that Mr. Semelin seeks to explain. Jews in France had advantages that didn’t exist in other nations. A large country, France was bordered by two neutral ones, Spain and Switzerland, to escape into. In addition, geography provided access to oceans and seas that offered other avenues of escape. And France was still primarily rural, with hundreds of villages ignored by even the Vichy authorities, affording plenty of places to hide. Mr. Semelin is also careful to remind us that anti-Jewish arrest and deportation practices varied over the four-year period of the Nazi occupation and the Vichy government, and thus provided various strategies for salvation. Many Jews were spared because they had money to buy protection or freedom, but Mr. Semelin lists other reasons. Even casual anti-Semites helped individual Jews, especially children, out of hatred for the Germans or the Vichy collaborators. In addition, French Jews (then called “Israélites,” emphasizing faith rather than “race”) had traditionally been socially integrated or assimilated. To hide a Jew in France didn’t carry a death sentence as it did in Russia or Poland. Finally, and most crucial to his argument, Mr. Semelin theorizes that a deep patriotism, and France’s republican tradition of human rights (the French were the first Europeans to grant Jews full civil status in 1791), often overshadowed residual anti-Semitism and created a “civil resistance rescue movement” that allowed most Jews living in France to escape arrest and deportation. In his conclusion, Mr. Semelin distinguishes his work from that of historians (mostly North Americans) who have argued since the 1970s that native prejudice played a large role in the French treatment of Jews. He cites Robert Paxton and Michael Marrus, among others, to attack their theories that posit deep French anti-Semitism and active Vichy collaboration in the arrest and deportation of Jews. If these attitudes and actions were so dominant, he asks, then how did 75% of Jews living in France survive? To which Messrs. Paxton and Marrus have countered: If they were so benign, then how was it that 25% were murdered? This study appears in English at a propitious time, as the virus of anti-Semitism strengthens in Europe and the U.S. Mr. Semelin (in a translation by Cynthia Schoch and Natasha Lehrer) details, in accessible prose and with cogent organization, the extraordinarily complex story of Jews—French and foreign—in France during the Occupation. Using both an archival and a narrative approach, he reveals extensive details about laws, regulations, policies and informal actions that targeted the Jewish population, but he never loses sight of the individuals who suffered insults from humiliation to murder. He draws on diaries and memoirs that detail the unpredictable life of a despised minority. He also draws on conversations with survivors, some of them well-known. His command of the historical record, and of both German and French archives, gives weight to his theories, which should encourage further research and discussion. But we must counter with stubborn questions. Can one really distinguish a “softer” anti-Semitism from a more virulent kind? In other words, did those “saved” Jews ever feel completely at ease? Isn’t being uprooted, separated from family and incarcerated in French labor camps, rather than sent east, still anti-Semitic? Finally, the most obvious question: How did the authorities—German and French—still manage to murder 80,000 Jews, including 11,000 children? This debate will persist. What to give up for Lent?